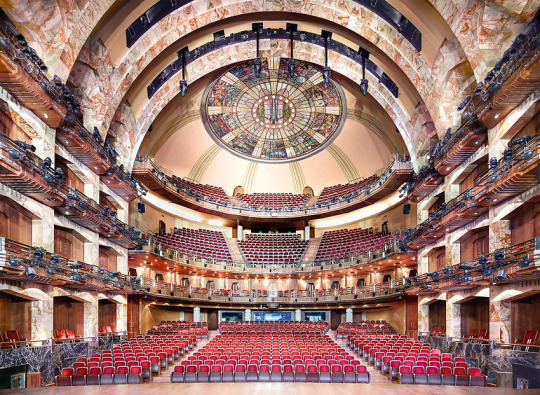 German photographer Candida Höfer presents an image set which documents Mexico’s architectural history from shadowy nooks to decorative Baroque churches and is to be exhibited in Sean Kelly’s New York gallery. 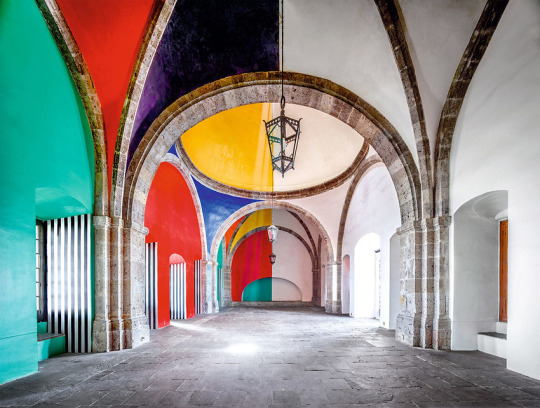 On a trip across Mexico four years ago, Höfer shot photographs of architectural interiors which will be brought together to form an exhibition called “In Mexico,” set to open up in February. As part of the Mexico-Germany Dual Year exchange programme the Cologne-based photographer toured Mexico with her camera; throughout 2016 & 2017 the partner countries aimed to share educational, musical, scientific, and cultural projects as part of the initiative. Höfer captured a series of buildings dating back to the 1500s as she travelled across cities including Mexico City, Oaxaca, and Puebla. 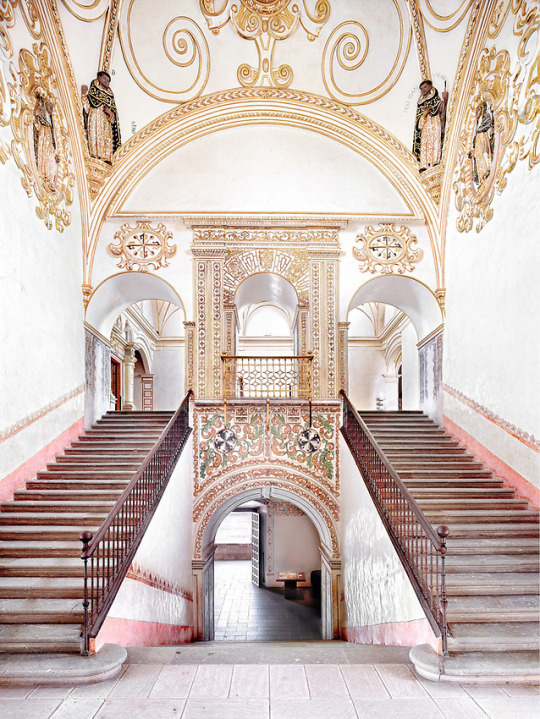 “Capturing over 600 years of architectural history from her precise perspective, Höfer’s photographs document not only the physical details of these interiors but also capture the spirit and essence of each space,” said Sean Kelly Gallery in a statement. 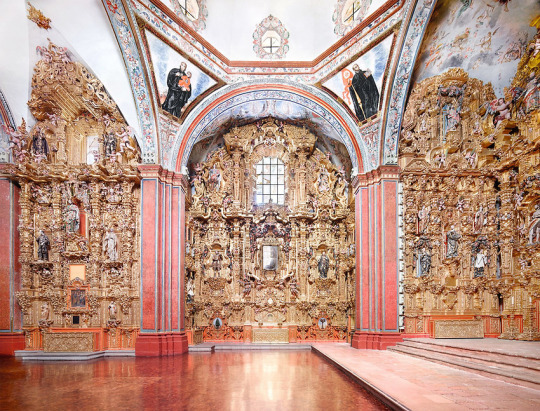 Built by the Jesuits in the 1500s the National Museum of the Viceroyalty of New Spain is among the earliest projects in the In Mexico set to be exhibited. Chunky, golden structures are seen beside pink-toned columns in Höfer’s image. During the 17th and 18th centuries the Baroque style flourished and their ornately detailed structures are captured by the interior shots. 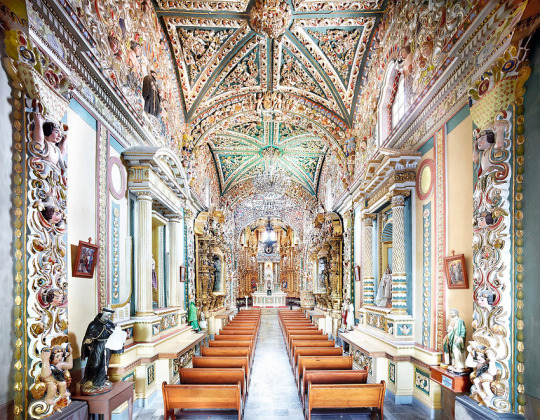 With statues protruding from the walls, Puebla’s Catholic church San Andres Cholula shows a decorative side whereas the Church of Santo Domingo de Guzmán, a monastery completed in Oaxaca in 1731, features floral patterns which cover its weathered walls. 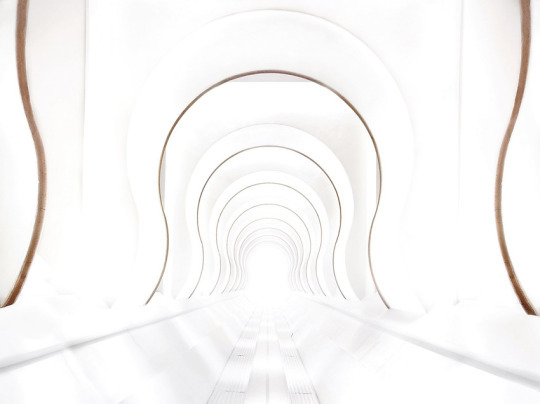 Typical of her photography style Höfer’s images are devoid of people instead drawing focus to the design of the spaces. “I realised that what people do in those places – and what the spaces do to them – is more obvious when nobody is present, just as an absent guest can often become the topic of conversation,” said Höfer. 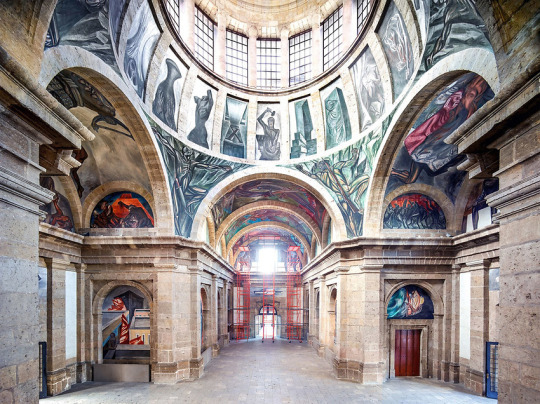 Höfer has captured The Hospicio Cabañas in Guadalajara which dates to the more recent time of the 19th century. Designed by Manuel Tolsá in the neo-classical architectural style the centre was built to provide care and shelter for disadvantaged people. Listed as a UNESCO World Heritage Site it is now celebrated for its architectural heritage. 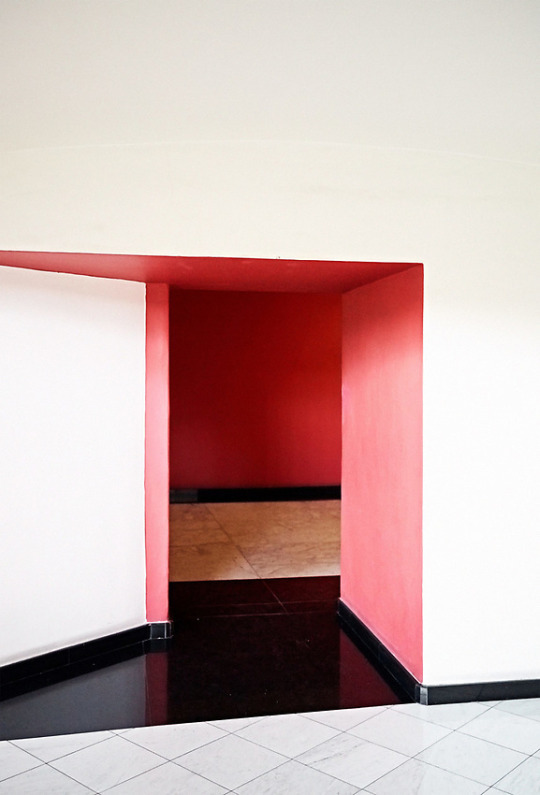 As part of a series of interventions by French conceptual artist Daniel Buren a feature added to the building is a rounded vault coloured in bold paint. Other more contemporary works in the series include the art-deco Basurto Building, shown in an image of a brightly lit curving passageway. Captured by the artist’s hand-held camera are also a handful of detailed images which show hidden nooks spotted in the country. 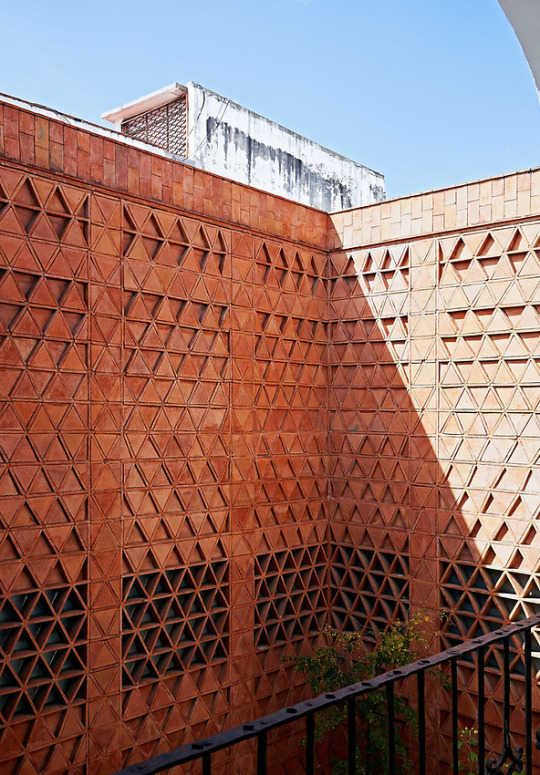 These include a courtyard covered in triangular tiles that create patterned shadow effects and an opening with blocky pink walls. “From the subtle light breaking through a doorway entrance to the harsh shadows cast by the sun on an exterior wall, these quiet yet emotional images enhance the dialogue between the micro and the macro and bring to our attention the details in spaces that are often overlooked or inaccessible,” the New York gallery said. This entry was posted in Culture, Exhibition, History, Photography, Recent Posts and tagged architecture, mexico, photography. Bookmark the permalink.